Here is the goal of the Start Digging Out Of Credit Card Debt Challenge…to get you started on your way to living debt free. You are not going to get out of debt this month or next month unless you are sitting on a pile of cash that no one knows about. But if you were, I would hope you wouldn’t be in any debt. I wanted to write a series of posts on finding your way to being debt free, as I get several emails every week asking for advice on how to pay off this or how to pay off that. Here is what we are going to do: Every Monday, I will post the next step for getting started on the road out of debt. Sure, some of this you have probably read about before, but I am going to slow it way down and make it much easier for you to follow. I believe that doing one step at a time is much easier than someone saying to you to accomplish everything you want done in one fell swoop. You did not get into debt in a week, and you will not get out of debt in a week. OK? OK. Your homework for this week is to gather up every credit card you own in a pile. Not your debit card, not your car loan, not your student loans. These are the types of debt you deal with after your credit card debt is all gone. Just your credit cards, each and every one of them. High balance? Go get it. No balance? Go get it. Once you have them each in front of you, write the name of each card, the balance due on each, the interest rate you are paying and the credit limit on a piece of paper. Do this for each card. Once you have everything listed out, I want you to take the card with the highest available balance on it and put it back in your wallet/purse. This is your emergency card, to be used for emergencies only. No new shoes or lattes at Starbucks with this card. Flat tires and such only. Now take every other card in your pile and put them in an envelope and put them away somewhere. Not far because we will need them next Monday, but just away enough that you don’t touch them. For the next week, do not use any of these cards you put away, and only use the one in your wallet for emergencies. You have to break the cycle and carrying only one emergency card can help you do that. Next Monday you will need your list and all your cards available for the next step to digging out of your credit card debt, so be sure to be ready! This will be a slow process, as I want people to understand each step as we go along, and not feel overwhelmed enough to not work through it. If you are serious about eliminating credit card debt, you have to start somewhere, and this is how I think you can best get started down that road. Credit Cards That Can Help You Get Out Of Debt. Do It Yourself Debt Reduction. Step 1: Check. Actually, check a while ago. Heh. I think you forgot to mention that you want them to move onto a cash basis for a while. That is to go back to using green backs instead of plastic with a revolving account tied to it. So many people I talk to use plastic for everything claiming it’s so easy to keep track of it. As youngsters we used CASH as our form of exchange. We also learned there was a limited supply of it. Today, the plastic seems to represent an unlimited supply of money to so many. When you go back to using cash – most folks are AMAZED at how their frugality of days long ago, come back like immediately. Why keep a credit card at all? Just establish a cash emergency fund and shred all of the cards? People that are in debt with credit cards generally have a behavior issues and that’s why they are in debt. I would suspect that keeping that Emergency card around, Clothes on Sale, big screen TVs on sale, new furniture will suddenly become emergencies and all of the sudden, they are more in debt than they were. I personally feel starting off with a clean slate is the best approach, going cold turkey so to speak. If the cards aren’t there, you can’t use them. Looking forward to reading your future articles on this topic, as I am in the middle of my debt snowball now. The reason I want people to keep a card in their wallet is for emergencies only. Figure if someone has a huge amount of debt, they dont have an emergency fund, right? Cause if they did, they should empty it to pay off the debt. Besides, people have to learn to control themselves slowly, as we are all adults here and have to be responsible to ourselves. Learning to carry a card and not using it is part of the program. Because people trying to dig out of debt get overwhelmed…and give up trying. You have to do one thing at a time in order to succeed. I classify car notes and student loans as sometimes necessary and credit card debt as not necessary. Besides, most people carrying credit card are paying way more interest on CC’s than they are on student loans or car loans. Conquering one thing at a time is way more effective; its the same strategy I use when helping people rid themselves of clutter. I already took this step so I guess I need to wait for the next step in the challenge. 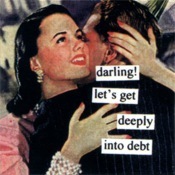 Husband and I paid off $23,500 in credit card debt this year. We cut up all our cards except one each and we kept the emergency cards at home. We also established a $1000 emergency fund first before we attacked our debt, that way if we had an emergency we could turn to our savings and not to more debt. You gotta figure out what works for you, but I didn’t want to be tempted to add more debt by carrying a credit card with me.